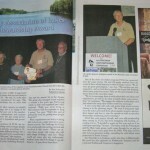 At the FCAL Annual Meeting on Oct. 12, 2013, President Lee Lamers reads the article from “Living on the Lakes” magazine in which he was interviewed. 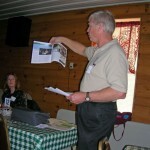 He was able to explain FCALs main emphasis on lake protection through education and prevention, along with advocacy wherever its members see that they can make a difference. 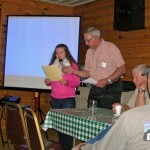 Christian Cold, Wildlife Tehnician/Educator for the DNR inspired everyone with his talk on reconnecting with nature. 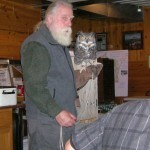 He was assisted with his partners – an owl and a hawk.